Fast forward another year, and I was still determined to master those babies. With all the gorgeous berries we’re picking right now, I could afford to play around a bit more. Right?! 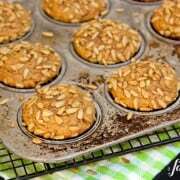 I had an “aha moment” a couple weeks ago as I was using one of my beloved scoops from The Pampered Chef to fill muffin tins with batter. I got excited at the prospect of scooping the raspberry scones dough straight from the mixing bowl, rather than patting the dough out on the counter top, and then cutting it into individual portions. As you can see with your own eyes, this technique worked beautifully. I had to play around with the recipe a bit more, and the dough was still a messy one, but the scoop did the trick. It proved itself worthy of a higher standing in our kitchen. 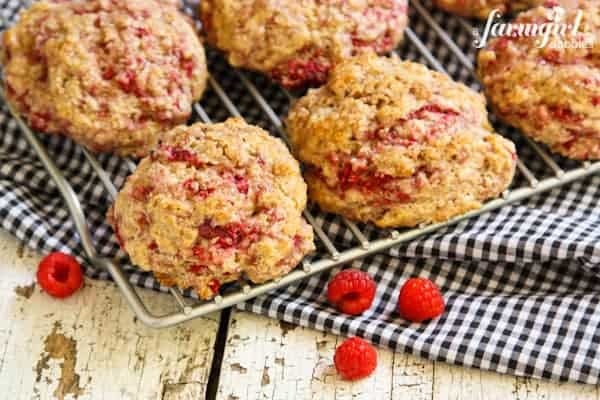 These Whole Wheat Raspberry Drop Scones, with ribbons of red berries throughout, are sweet (but not too sweet!) summer joy. They are moist on the inside, with a thin crackly raw sugar outer crust. So worth the wait. In a bowl, stir together flours, baking powder, salt, and sugar. With a rigid pastry blender, cut in butter until mixture resembles a coarse meal with larger pea size pieces. Add raspberries and fold gently to coat. Make a well in the center and then add buttermilk and egg. Stir just until combined, taking care to not over mix. The dough will be very soft. Put a bit of flour in a bowl and coat your hands. Knead the dough 2 or 3 times, right in the bowl, coating your hands with additional flour as needed. The dough will be very loose. Using a large scoop (I used the “large” Pampered Chef scoop), transfer scones to prepared pan, dividing into 9 equal portions. It works best to slightly compress the dough into the scoop using the side of the bowl, so the dough is compact. With the scoop I use, the dough is a big rounded scoop. Brush tops of dough with egg white and sprinkle with raw sugar. Bake until scones are golden brown, about 13 minutes. Let cool on pan for 5 minutes and then remove to a wire rack. Serve slightly warm or at room temperature. These are definitely best eaten the same day. But a great trick for eating them the next day? Simply preheat a baking stone in a 300° oven and then set already baked scones onto the stone for 3 to 5 minutes. The scones will be almost like fresh baked! I am giving away a few of my favorite kitchen tools from The Pampered Chef!! The scoops are made of heavy-duty stainless steel and make portioning batters for muffins, cupcakes, and cookies a breeze. Their squeeze-action handles are super convenient for one-handed use, and they wash up beautifully in the dishwasher. I love having all three sizes! And the Scoop and Spread?! I guarantee you’ll never get a jar of peanut butter as cleaned out as I do with this fabulous gadget! One end is made of flexible silicone, and has a slight scooped shape. That’s the end that gets the peanut butter jar clean. The other end is more rigid, with a serrated edge, perfect for cutting sandwiches and spreading on butter, cream cheese, and jam. It’s a little tool that thinks big! You definitely want to get your hands on these! Enter this giveaway using the Rafflecopter widget below. Disclosure: The Pampered Chef provided me with these tools, plus the giveaway package for one winner. I was not compensated to write about them. I just love using them and wanted to share them with you! All opinions are my own. Cupcakes & muffins & Melons and Ice cream scooping. Peanut Butter & Jelly scraping!! I would use the scoops for baking :) Cookies of every size and type, cupcakes, muffins… YUM! These scoops would come in handy making cream puffs! The recipe sounds delicious! And the Pampered Chef giveaway is way cool! Portioning for drop cookies, and ‘measuring’ for Alton Brown’s English muffin recipe. I would use the scoops to scoop cookie dough! Or make little round balls of melons! Or scoop ice cream! I’d use the scoops for cookies, scones, muffins, and ice cream! And spread? Whipped feta! I’d use them for making meatballs, cookie dough, melon balls….and anything else I could think of. Love the recipe! I would use the scoops for cookies and batters. I’ve only ever had a small scoop that I use for melon. I have a few Pampered Chef products and I absolutely love them. These products have been on my want list for ages but I just don’t have the money to buy them at the moment. 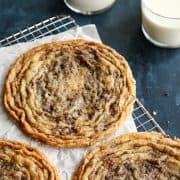 I love making cookies and also one of their recipes which uses the scoop and I have to use a spoon whic is a total nightmare. 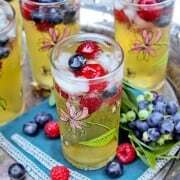 I would try this recipe with blueberries, our CSA box is overflowing with them! These are so pretty, Brenda! Wowzers. Hope you had fun in Chicago! I would use these for aiding in cupcakes, muffins, cookies, pancakes… everything. I’ve been wanting these for a while. Hope I win… oh and I can’t wait to try this recipe. Looks sooooo good! I would use the scoops for baking cupcakes & cookies. The small scoop is perfect for candy or thumbprint cookies. I like the medium scoop for regular cookies and meatballs. I use the large scoop for cupcakes and monster cookies. Ok yum!!! I cannot wait to make these!! I would use these scoops to portion cookie dough perfectly onto cookie sheets! I use scoops to measure muffin batter, pancake batter, timbales, vegetarian patties, mounds of individual stuffing, to serve mashed potatoes & souffle, measure portions of Trail Mix into individual baggies, shall I keep going?! My kitchen habits keep finding new ways to use them. I often spray them with PAM so set ingredients slide out more easily. All the drop cookies possible!! 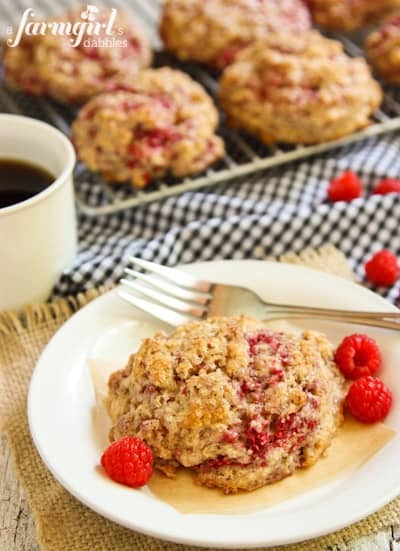 I love raspberries, and these scones look divine. They’re making my mouth water. I have one cookie scoop, which limits my ability of usage. I’d like to have different sizes for making cookies, and filling muffin tins. The scoop and spread sounds like it’s a multi-tasking kitchen tool, and one that would be very handy to have. 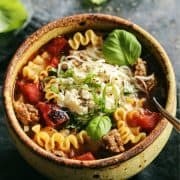 By the way, does Pampered Chef have any diabetic, or low-carb recipes? I have the large scoop and use it every time I make muffins or cupcakes. I imagine the other sizes are great as well! I need a scoop for my cookies. My old one broke, so I’m scooping dough out with my fingers! I would use the scoops for fruit salad, cookies, scones, and more! I would use the scoops during my annual Christmas cookie baking day with my mother. I would use the scoops for making snickerdoodles and muffins. I am sure I would find many more reasons to use them once I had them! Oh and cleaning a jar of PB….always! I love my Pampered Chef scoops they make baking easy! I need these scoops for baking cookies! Great for cookies, pancakes, muffins, makes it so easy. These look marvelous Brenda, gorgeous color! Cookies, muffins, ice cream…scones? Why not?? I would love to use these scoops! I would use them for cookies, muffins and ice cream! The obvious is for cookie making, but I think scooping anything, from mashed potatoes to ice cream, would be in store! There are too many ways to list. I keep looking for the smaller scoop, didn’t realize it was Pampered Chef. I’ve never tried to make scones before so I would test my luck with this recipe! I would use them to make cookies. These sound incredible! I love raspberries! I have no scoops as of now and just last night made some scones and cookies and was thinking for the umpteenth time, boy a scoop would really be helpful right about now!! So I could use scoops for scones, cookies, muffins, ice cream, anything and everything!!! What beautiful scones! I love that they are whole wheat too! I would use the scoops on a daily basis to cook with! My raspberries are finally in. Finally! I am adding these to the list on how to use a few of them. Would use the Scoops to make even portions of so many things especially cookies, muffins and cupcakes. The Scoop and Spread would be so great for peanut butter and jams. For baking and making fruit bowls and whatever else I can think of, a great prize! I would use them for all of my baking needs! I LOVE LOVE LOVE Pampered Chef products. Would love to make evenly-sized cookies and muffins with these scoops. Yum! Would use the scoops to make muffins of many flavors! Oh man, cookie dough, truffles and muffins! Thank you! I would like to try the scoops for baking too. I still use two teaspoons or pinches to roll dough. It would be GREAT to get all baked goods perfectly proportioned. Thanks for the great recipe I can’t wait to try it. I would use them to make cupcakes and muffins. Mmmm!!! They look delicious!!! The scoops are great little portion controllers so I would use them for a number of things like cookies, scones, and scooping muffin or cupcake batter into the wells. Oh my, these look so yummy, Brenda! Love the idea of the scoop to make the scones, which I will definitely try. I always wish I had some different sized scoops for different tasks like drop cookies, muffins, etc. These would be perfect for all of those things and more! Your scones look lovely! 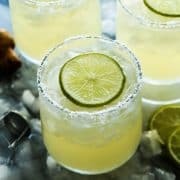 I love these so much — can’t wait to make them! I love me a good scone! If I won the scoops, I’d make a batch of cookies! These are beautiful, Brenda! I just recently discovered the scoop method for my scones, too — works every time! I’d use them for making biscuits, scooping Ice Cream helping with portion control. I’d use them for my cookie dough. I would love to use these tools for all the gluten free baking I do! I would use them for all my baking needs!!!! 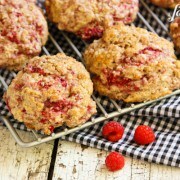 Your scones are right up my baking alley, plus I love raspberries! I have black raspberries in my yard that are ready to pick right now. They won’t be as bright and pretty as your red ones are, but I know they will taste yummy! These scoops are great for baking, ice cream, mashed potatoes and a lot of other things. I subscribe to your emails. Love your scoops and thanks for the opportunity. These look wonderful. I printed this to try tonight. 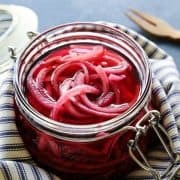 Such a fabulous recipe!! Love it! I know what I’m making this weekend!! Gorgeous!! I love scones, these look incredible! I’d use the scoops for cookies. Definitely to make cookies. Love Pampered Chef! What a great idea to use the scoop! I’ll have to try that out! The possibilities are endless the kids and I would start cooking muffins and cookies right away!!! I would use them mostly as cookie scoops. I like uniformity and they will all bake the same if they are the same size. 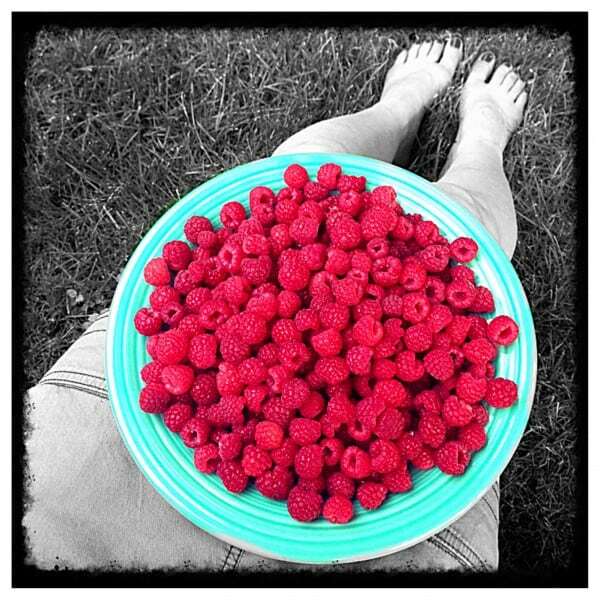 Love raspberries! These turned out great! 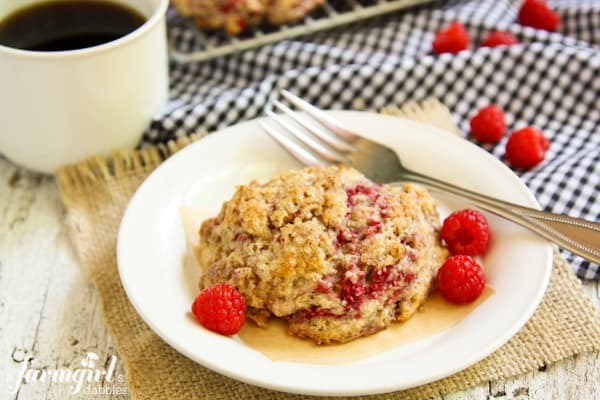 I love fresh raspberries and these scones look amazing! I would use the scoops for my cookies & cupcakes. I have 2 of the pampered chef scoops already but one got off kilter. I think I’m missing the large one. Thank you for the opportunity. I would use them for muffins, drop biscuits and cookies! Cookie baking!!! And meatball making! 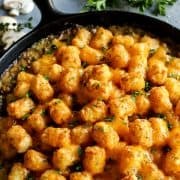 Such a gorgeous recipe!! I just made a blueberry oatmeal bread and added some of the raspberries from our picking this weekend. I just might have to go picking again!! I would use the scoops to some cookies! I want to give these scones a try! I have loads of blueberries to use, though, so I’d sub those for the raspberries. 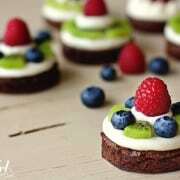 I love baking/cooking of any form – cookies, cakes, cupcakes you name it! I’d use the scoops for scooping cookie dough, meatballs, all kinds of things. I would be able to stop using spoons for scooping. It’s that simple! 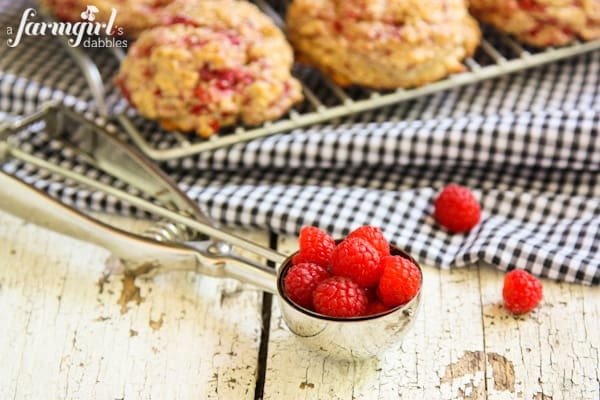 Your scones and cookie baking when the cool weather comes back! I would use them when I make cookies, muffins and these beautiful drop scones that you made! I LOVE drop scones! So nice not to have to shape them (I guess I’m lazy…or maybe I just love my scoop haha). Thanks for the frozen yogurt love, and hope to run into you at BlogHer this week! I’d make banana or blueberry muffins!